The Olive Ridley (Lepdochelys olivacea) is the second smallest of the sea turtles, with sizes marginally larger than its close relative the Kemp’s Ridley. They weigh around 110 pounds and measure only 2.5 feet in length. They get their name from the olive green color of their shell and are found in tropical waters of the Atlantic, Pacific and Indian Oceans. Even though they are one of the most abundant species in terms of population size, they are currently listed as Vulnerable by the IUCN Red List due to their smaller range and limited nesting habitats. Any major disturbance to just a few of their nesting beaches could be detrimental to the species. The Olive Ridley faces threats from poaching, marine debris and bycatch. Conservation efforts to save this species span many countries, as nesting beaches occur in over 10 different nations. 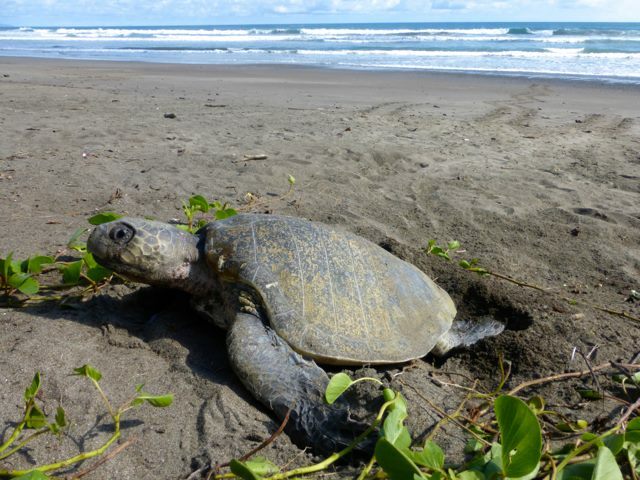 Important beaches throughout Central America have been protected as reserves. Modifications to fishing gear will help reduce the amount of incidental capture of sea turtles in the ocean.